THEY’VE been adored, mocked, forgotten about and rediscovered but come this summer there will be no more tours from The Osmonds. After releasing a staggering 200 albums, selling more than 100 million records and lining their walls with 59 gold and platinum discs they’ve decided enough is enough. While it’ll be a shame not to hear glam rock stomper Crazy Horses done justice again at least it means the awful Long Haired Lover From Liverpool might finally die a death. Then again, the song’s original singer, Jimmy Osmond, reckons he tried omitting his 1972 chart topper once because it felt odd singing it. “I was playing Wembley not too long ago and I left it out of the set,” he says. “Everybody started stomping their feet and singing it because they knew they weren’t going to get it. “I thought ‘who wants to hear that?’ because I’ve never taken it seriously. I kind of realised my job is to help them remember their memories of when we were lucky enough to be on the radio. “It’s not really about us, it’s about celebrating we had that connection together. So I look at it differently now; I don’t mind it at all. It was also, of course, one of the songs that marked Jimmy out as an individual – as ABC did Michael from the rest of The Jacksons in America’s other massive showbiz family. 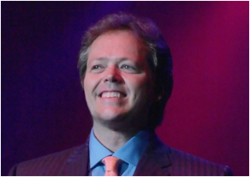 Jimmy arguably built on that, and still does, as the joker of the Osmonds pack. You had Donny for the ladies, Marie for the boys, and Jimmy the cheeky kid. “I was the mascot,” he laughs. “What was weird is I was the first one to ever record in my family and the first hit record we had was in Japanese. “I would go over there and endorse these soft drinks and have my own record and would come back and tour with my family. “And I thought every kid did what I did, growing up. Up Close & Personal is the final brothers tour, however, from a musical family that seems to have no end to its number of siblings. South Yorkshire gets two shots – Sheffield City Hall on April 6 and Doncaster Dome, five days earlier – midway through a sprawling 50-date tour. So why stop now, we ask Jimmy. “That’s what I keep asking,” he says. “It’s not my idea, but the truth is the four brothers have been working together a long time. “My older brothers have been working together for 54 years and that’s a very long time, never having stopped, doing at least 100 shows a year since the beginning. The Osmonds were last in these parts at Sheffield’s arena along with Donny. This time they play the kind of theatre-sized venues they frequent in the States – seeking to make it a celebration more than a wake for their fans. And once this line-up has sung the likes of One Bad Apple, Down By The Lazy River, Let Me In and Love Me For A Reason a final time, some brothers are retiring from performance. Jimmy hasn’t made his mind up what he is doing, although we suspect we won’t lose him that easily. With half his year split between the UK and the family home in Utah in recent years, he’s become something of an honorary Brit with acclaimed West End shifts in Grease and Chicago. He’s also just finished doing panto again – Aladdin in Swansea – and then there was that celebrity episode of Come Dine With Me. “They never stop playing that silly show. I thought they would just show it once,” he says, welcoming the suggestion he’s turning into one of us. Whatever happens next The Osmond catalogue remains like a musical diary of their lives. “Growing up the way we did, on television with our own variety shows and specials, we got to work with some amazing people in the business,” says Jimmy. “At the end of the day we take away all our experiences and we’ve had a few fun days and still love what we do, so I think we’re pretty lucky. All that said, Jimmy isn’t keen to recommend his kids – who range in age from nine to 17 – become the next generation of singing Osmonds. “If they do choose it I’ll be supportive. There’s a lot of pitfalls and I know a few ways to help them. “But I found with my nephews the Osmond name has almost been a curse, more than a blessing. You would think you would have the connections or whatever, but in some ways the expectation level on some that have tried it... they’ve done well but they have an extra sense of scrutiny because of who they are. It’s been interesting to watch that. “You look at maybe Michael Jackson’s kids. If they decided to do something, and a couple are considering it, that would be a very hard go. You’d definitely get the attention, but you would always be compared. “That’s the way we were growing up. Fortunately I had my own success and created my own little niche within the Osmond brand and that really blessed my life, but some of my brothers are pretty trapped because they were always just a group, they didn’t go out on their own. “I’m grateful for those experiences but I think we’re all better together than as individuals. There were so many funny experiences. It’s not always been rosy for us, we don’t all get along all the time, but the truth is we’ve figured out how to keep it together and how to agree to disagree, not take it personally and preserve the most important thing we have, which is our family. “We have every right in the world to have never spoken to each other again because of the business and the issues that come up, just the silliness that happens in this fake world of showbusiness.